Earlier this year, we passed our 10 MILLIONTH visitor to this site. 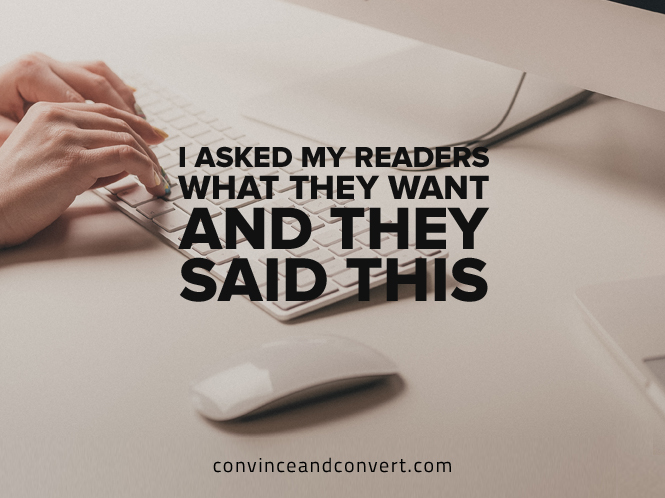 As part of our promotion around that milestone, we asked Convince & Convert readers and subscribers to our Definitive email what topics they would like to see my team and I cover more, and the answers were remarkable. The marketing (and customer service) industries continue to change and morph with new platforms, new best practices, and new things to avoid. And of course, our consulting team is working with big companies all over the world on these issues, but it’s very interesting to get a broader perspective from readers. Despite the fact that I think we cover content marketing quite a bit, it seems VERY clear that more on that topic is desired, with emphasis too on strategy; social media; and best practices. Here are my 10 favorite requests that I want us to address in the coming weeks. Do you agree? Disagree? Let me know in the comments, or on Twitter or Facebook or Linkedin. From Sharon Goldmacher: What’s the best ratio of new content to refreshing existing content? From Keri Toomey: How do you know if you’re creating too much content? From Judson Voss: What are be the 5 required daily activities you should partake in if you have a small content marketing department? From Sarah Beatty: What do you see as the role of employee advocacy in content marketing efforts? From Winnie Anderson: How do I get my social media contacts to join my opt-in email list? From Eli Becker: How do you track conversions with influencer campaigns? From Jenell Webber: What are the differences in engagement rates between video and picture content? From Elizabeth Whitten: How much should you rely on competitive analysis when developing a blog strategy? One note on this list. I don’t expect people to read everything we publish here, but we have covered a lot of the topics that were requested by readers. We have more than 2,500 posts on this site, so make sure to use the search box if you’re curious about a particular issue in content marketing, social marketing, influencer marketing, or customer service. We may have answered your question already. Also, our Definitive email (which covers one topic per day) has an Archives feature where subscribers can access our complete library of curated content for a huge array of digital marketing topics. It’s super useful! What didn’t I include in this top 10 list that you REALLY want us to write about? Let me know below, and I’ll write about it or will pass it to our editorial geniuses to make sure we get it created for you. Thanks as always for your ideas, your interest, and your faith in all of us at Convince & Convert. We don’t take it for granted!